My PC sound card is connected to my stereo amplifier, which is out of reach when I sit at the computer—and the remote control is always lost. So I bought a used Behringer Eurorack UB502 mixer to control the volume more conveniently than through the PC's mixer programs. With it I could also connect an FM radio as a program source. Plus I can use the mixer as a headphone amplifier! Using headphones was completely impractical with my old arrangement. The mixer is fine for this purpose except for one thing: The headphone amplifier with its own volume control is post-fader—in other words, the mixer's "Main mix" fader also affects the headphone volume. This means that setting the "Main mix" fader to zero (to silence my loudspeakers) also silences the headphones! I really wanted to be able to control the headphone and "Main out" volumes independently! This (much simplified) block diagram shows how the UB502 is wired internally. You can see that the headphone amplifier is controlled by both the Phones fader and the Main fader. The mods I wanted to do are shown in red: Basically bypass the Main fader from the headphone amplifier's input. That would provide two independent volume controls: one for controlling my stereo amplifier, one for the headphones. 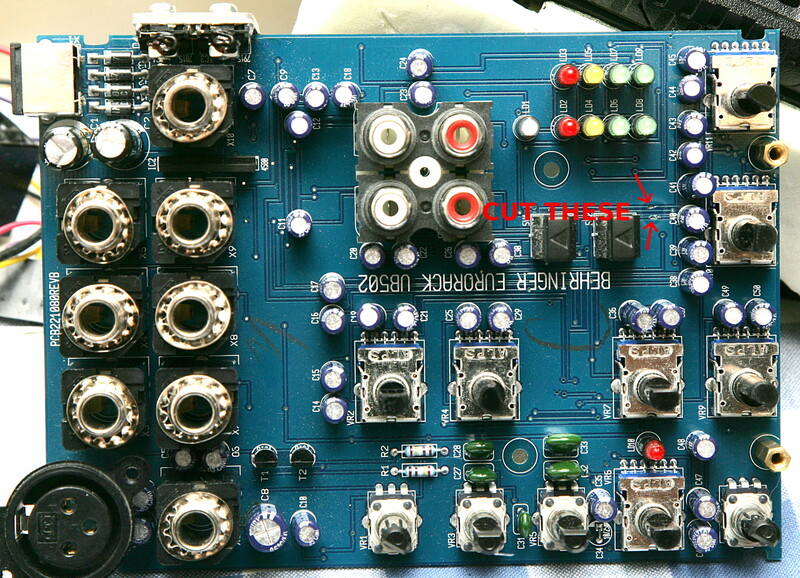 I found the schematic for the Behringer Xenyx 502 online, and it seems to be identical to what I found inside my mixer—all the component values and their reference numbers were the same. If you look at the schematic's sheet 2, you see the headphone amplifier circuit gets is signal from switch SW1A/SW1B (the "Tape to phones" switch). It selects either the tape input directly (with the switches in the down-position), or the mixed signal, post-fader (with the switches in the up-position, as drawn on the schematic). I decided to take the signal for the SW1A/SW1B up-position from elsewhere in the circuit, before the "Main mix" fader. I decided a good place to take the signal would be between C42 and R77 (for the left channel, to SW1A) and between C43 and R90 (for the right channel, to SW1B). But first I must isolate those terminals of SW1A and SW1B from the rest of the circuit. 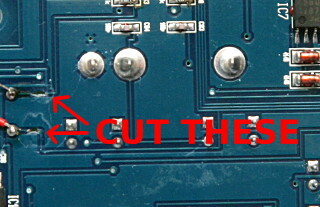 To isolate the switch, you must cut four traces in the circuit board. To access the proper places, you need to completely remove the circuit board from the chassis. First pull up all the various potentiometer knobs (they are only friction-fit and will come off by pulling only). Remove the six screws on the bottom of the chassis (remember which ones go where!) and pull off the bottom panel. Remove the four screws on the sides of the mixer and remove the plastic side panels. 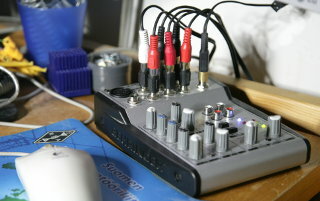 Remove the two screws around the XLR connector, the one in the middle of the four tape in/out RCA connectors, and the two near the front of the mixer. Finally remove the nuts and washers holding the eight 6.3 mm phone jacks in place, and remove the circuit board. On the top side of the board, cut two traces as shown (see the full image here). The ones you want to cut are the top and bottom one in that bunch of four. Try not to damage the adjascent traces (as I almost did). When cut and cleaned up, I put a drop of cyanoacrylate superglue on the area for no special reason. 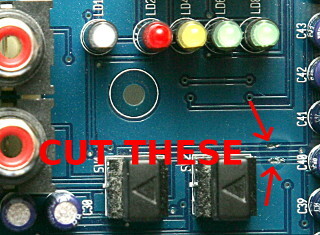 On the bottom side of the board, cut two more traces as shown (see the full image here). The ones you want to cut are the ones going to the two rightmost pins of the switch. I likewise covered these areas with cyanoacrylate. This has isolated the required pins of the switch, but has also cut the circuit it was connected to in half. 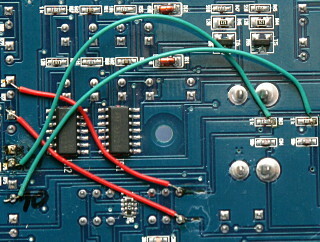 Two jumper wires must therefore be soldered in place on the bottom side of the board (the green ones in the image, see the full image here). One wire goes from the positive terminal of C40 to the right-hand end of R40 (when viewing the board as shown in the picture). The other wire goes from the positive terminal of C41 to the right-hand end of R43. With this done, no signal at all goes to the headphone amplifier when "Tape to phones" is not selected, but the "Main out" works as before, as do the "Tape to phones" and "Tape to mix" switches. Finally, to connect the isolated terminals of the switch to the pre-fader main mix signal, solder another two wires (the red ones). One goes from the negative terminal of C42 to the lower-right pin of the switch. The other goes from the negative terminal of C43 to the upper-right pin of the switch. 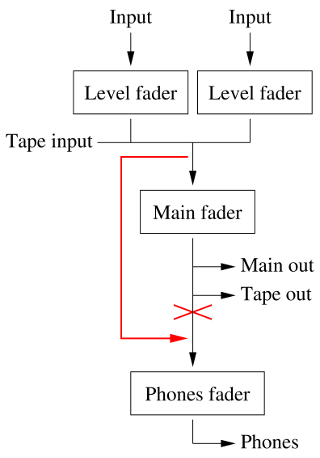 This essentially parallels the headphone amplifier section (when "Tape to phones" is not selected) with the main mix fader and Main out section, completing the modification. 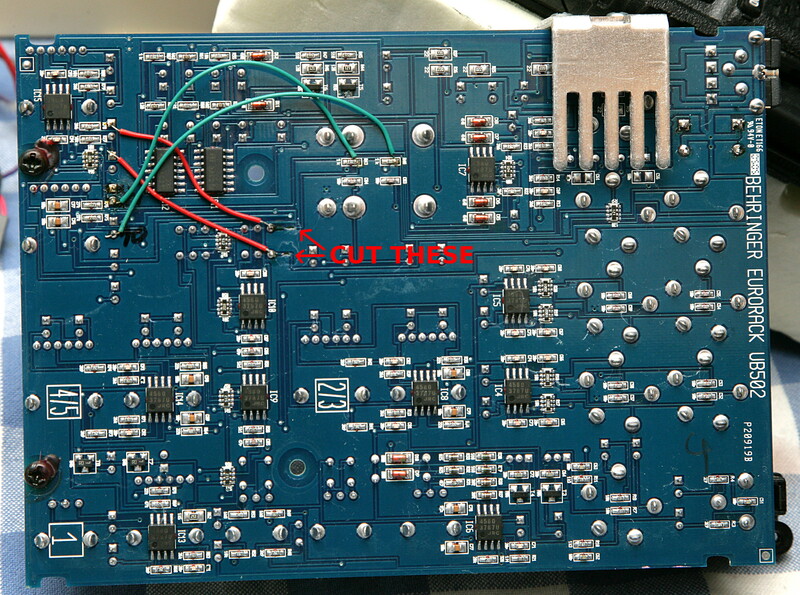 When soldering the jumper wires, make sure you don't short-circuit them to any other nearby components or board traces. And while you're inside the mixer, you might consider replacing the power supply filter capacitors (C1 and C2, both are 470 μF 35 V electrolytics. Use 105°C ones, preferably low-ESR type if you have them in-shelf, but ordinary ones are fine too). One of them was visibly swollen on my unit. This is the first time I have ever seen swollen capacitors on a linear power supply! On SMPSs they are an everyday nuisance, but to start failing on a linear supply they really have to be cheap! Reassemble the mixer and test it. If all has gone well, you can now control the main and tape outputs with the "Main mix" volume control, and the headphone output with the headphone control, independently! The "Tape to phones" and "Tape to mix" switches work exactly as before. The level indicator LEDs, however, are now pre-fader, so they keep blinking along with the mixed signal even if the "Main mix" fader is turned down to zero. But blinking LEDs are nice—why should they turn off just because the music is silenced? Ok, maybe they're not useful anymore for adjusting levels when mastering a musical recording, but I'm not using this mixer for mastering anyway. On the other hand, if you did manage to break something in the course of your attempted modification, you now have a broken mixer, congratulations! So don't attempt this modification unless you know what you are doing and are willing to take that risk, and in any case don't blame me for anything bad that happens!